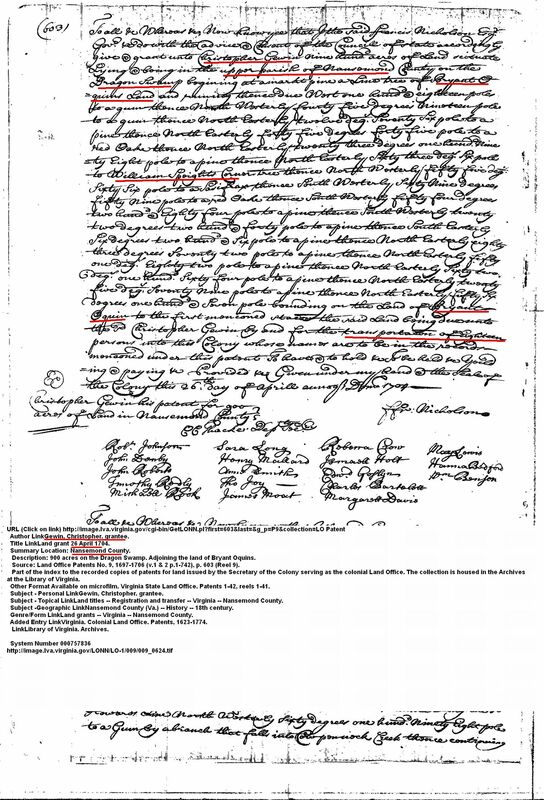 (Note: The Gewen line does not appear to be a “Going” type surname – they consistantly spell their name either Gewen or Guin over the years up to the 1800s. I list it here so others researching this name can see the information and make their own decision). 1704 Apr 26 – Christopher Gewin recd 900 acres on the Dragon Swamp. Adjoining the land of Bryant Oquins and William Speight, in Nansemond County, Va. (this could be Jr or Sr). 1704 Oct 20 – John Harrold recd 230 acr near a swamp called the Dragon Swamp. Beg.g at a pine a line tree of Christopher Gewins land, in Nansemond County, Va. (This could be Jr or Sr). 1714 June 16 – Adam Harrold 112 acres near the Dragon Swamp. Adjoining the land of Edmond Bemond and Christopher Gowins, in Nansemond County, Va. (This could be Jr or Sr). 1739 Feb 25: Monday the 25th of Feb 1739 (1740). February Court, 1749. Son and Executor: Christopher. Daughter and executrix: Mary Harrell. Grandsons: Lot, Abell and Christopher Harrell. Wits: James Braswell, Benj Braswell, Abraham Dew. Clerk of Ct: Benj Wynns.